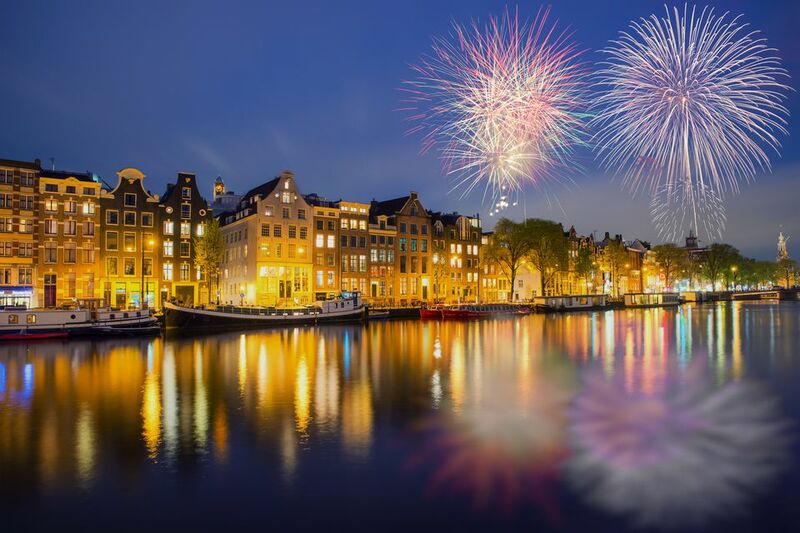 Will you be ringing in the new year in Amsterdam? If so, be sure to plan well ahead because this is a popular destination for holiday revelers. Here are a few tips to make your New Year's Eve in Amsterdam easy and enjoyable. New Year's Eve is called Oud en Nieuw ("old and new") in Dutch, in reference to the last moments of the old year and the first moments of the new. Another name is Oudejaarsavond, which literally just means New Year's Eve. Impress your Dutch friends by wishing them a happy new year using the phrase Gelukkig Nieuwjaar (pronounced "huh-LOOK-uh NYOO-yahr"). Public squares = parties. Not into exclusive club parties or multi-course dinners at swanky restaurants? Then join the festivities at one of Amsterdam's ​city squares, which are free to the public and located in various spots around town. The Museumplein public space in the Museumkwartier neighborhood is the location of the national New Year's Eve party, a televised event that draws tens of thousands of partiers with its live music and fireworks. The Nieuwmarkt square (in Amsterdam's Chinatown) follows closely behind with its explosive celebrations. Make room or dorm reservations well ahead. Amsterdam is an immensely popular New Year's Eve destination; sometimes it seems like out-of-towners outnumber the Amsterdammers at the yearly celebrations. This means that accommodations are at a premium, so don't delay making your reservations. Keep on the lookout for errant firecrackers. The sale of fireworks is prohibited in The Netherlands, except for December 29 through 31 when the Dutch stock up for New Year's Eve. At midnight, everyone pours into the streets and the city erupts in a collective cacophony of firecrackers, so be careful not to stumble into the line of fire. Consider packing some earplugs. Find out about venue entry requirements beforehand. Countless bars, clubs, and restaurants in Amsterdam have special New Year's Eve events, and tickets can sell out months in advance. For specific events, find out if it's necessary to reserve a spot, and do so as early as possible. Note that some venues also have additional entrance fees on New Year's Eve—even those that normally have none at all. Check for closures or reduced hours. Although New Year's Eve isn't a national holiday, scores of restaurants, tourist attractions, and other businesses are either closed or have reduced hours on December 31. When you make your plans for the day, be sure to double-check whether all the spots on your itinerary are in fact open on New Year's Eve, even in the daytime. Expect most businesses to be closed on New Year's Day. Amsterdam public transportation stops at around 8 p.m. on New Year's Eve, and only limited bus services resume around midnight. If you don't want to shell out for a taxi, make sure you're close to your New Year's destination by the time services stop. You may also want to check the GVB (Amsterdam public transit) website to find out whether your accommodations are on one of the limited bus routes for the return trip.